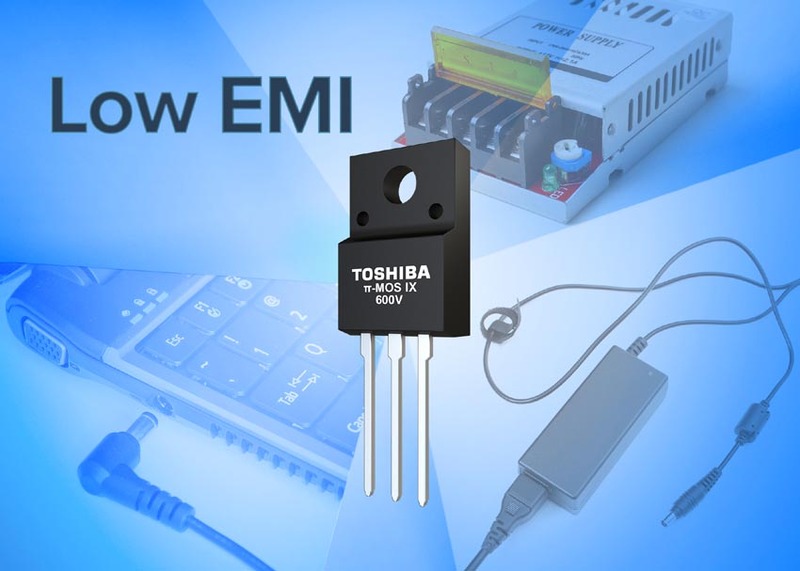 Toshiba Electronics Europe announced the launch of a new series of 600 V planar MOSFETs known as “π-MOS IX”. The new series is aimed at small to medium switching power supplies such as those found in notebook PCs, AC adapters, games consoles and lighting applications. Featuring an optimized chip design, the π-MOS IX series achieves up to 5 dB lower peak EMI noise than the current generation (π-MOS VII series), while maintaining the same high level of efficiency. The initial π-MOS IX series will include the TK1K9A60F, TK1K2A60F, TK750A60F and TK650A60F with RDS(ON) values ranging from 1.9 Ohm down to 0.65 Ohm. They have the same rated avalanche current and DC current (ID), thereby permitting simple and easy upgrading of existing MOSFETs. The devices are housed in a standard TO-220SIS package and offer greater design freedom, making the task of designing-in MOSFETs simpler. Toshiba will expand the π-MOS IX series with the addition of more 600 V devices as well as 500 V and 650 V variants.